The City Mayor, accompanied by some members of the Sangguniang Panlungsod, Congressman Arnie Teves, department heads, consultants, and representatives of Puregold led by Mr. Antonio Delos Santos II and Architect Hubert Co, did the honors of laying the time capsule during the groundbreaking ceremony for the new three-storey shopping mall on the afternoon of June 18, 2018 at what was once the old city hall grounds. Puregold will soon stand on a 1.2 hectare block (roughly 17,000 square meters of prime urban lot). As the architectural design presents, it is a department store up and supermarket down plus other locators and 2 movie houses on the sides. It will cost 468 million for the contractors. In its construction, 80% of the skilled workers must be Bayawanons and 80% of its employment force should be Bayawanons. 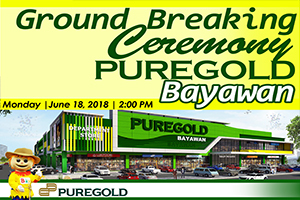 On a 30-year lease agreement, Puregold paid 361M to Bayawan City-LGU. The said amount will be spent for these priorities: 11M for 2 units of street-sweeper trucks, 13M for cane loaders and tractors, 155M for road networks in various barangays, 60M for the poultry dressing plant, 20M for the sports complex, 5M for Narra Water Park (slides), 60M for the City Engineer's Office (tools and equipment), and the remaining 20M as reserved for immediate fundings.